Formatting tree with marital generation gap? Home » GenoPro Help and Technical Support » Using GenoPro - How to... » Formatting tree with marital generation gap? I like to keep all the generations of a tree in line, nice and neat. But I've come across a marriage between distant cousins who are of different generations. Conundrum. (B) elongate the parent-child line for the spouse who sits higher up the tree, bringing them a generation lower. For some reason (B) seems neater to me. Maybe because it's a touch more compact horizontally? Or because I instinctively expect a longer vertical line to lead to a child, rather than spouse? But then you'd have to lower their sibling/s too, because they'd look strange separated, especially if a younger sibling ended up a generation higher on the tree. Is there an official way to handle this? (A)? (B)? Something completely different? And if there's no official guide, I'd still like to hear what people personally recommend. I'm the same way when it comes to generation alignment in my tree. When it comes to situations like the one you've described, I try to have spouses at the same vertical level, unless there's a large difference in age. Basically, I like to have my generations line up chronologically, at least roughly. It can be a problem to do it this way if you're missing a lot of dates, though. I'm currently trying to do this with a genogram built from the relationship information from the Norse sagas, and I have some *huge* gaps that I'm trying to resolve. Some have been a case of mistaken parentage; I got the child attached to the wrong parents. But some are correct according to everything I can find, and I still have gaps of half a dozen generations between husband and wife! If my hair hadn't already fallen out, I'd be tearing it out! You think trying to keep the Norse sagas in order is hard? Try creating a tree for the Norse gods. Odin was such a pain. Urgh. How many affairs and illegitimate children does one god need? Including one with his son's future wife, so goodbye any hope of keeping spouses on the same level, unless they're also level with their own kid, which no. I eventually gave up because of the primeval cow. Like, does that count as a pet? And how do you categorise a salty ice-block? Worse, how do you indicate salty's, er, union(?) with the cow, which licks a person out of it? To say nothing of that one dude without a father, but somehow nine mothers, who are all sisters and thus each also his aunt, incidentally. Some trees just make it really hard to keep things neat. But I digress. You suggested option (B), move the spouse down, but only if they're near-ish in age, so as to keep same-age generations on the same line? Does that mean you'd advise dropping individuals down a level when generations naturally start to diverge? Like, if an older sibling had kids young, but their much younger sibling had them late, so sibling two's kids are more of an age with their cousin's kids. If that makes sense. How you arrange the display varies according to your interest:genealogy; family history or whatever. We tend to think of a cousin as a first cousin but the word originally just referred to a relation, or even 'coz' in Shakespeare seemed to be a friend. 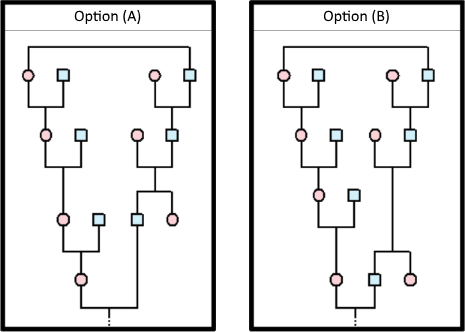 I'd say, if it's a Patrilineal tree, move the female to the male's tree ... if it's a Matrilineal tree, move the male to the female's tree. In my experience with a family tree with a lot of endogamy, trying to keep everyone "lined up" quickly makes the genomap look like a big bowl of spaghetti. I now use hyperlinks to have a female appear in her husband's tree, and use special colouring to show that it is the same woman in both locations. You can quickly see marriages between generations in a geneaquilt since the connection sticks out like a sore thumb. Tibbie, I've done the Norse gods. That was where I started, and it was Odin's mortal kids that got me into the saga genealogies. Heimdall's nine mothers were fun, and they're the one "problem" I'll never get out of my Problem Spotter list (I also currently have 81 birth order errors in that file). What's been causing my headaches is chronology; there is next to no structure in the timeline, except for that imposed by who is whose child, and when different sources ascribe different parents to the same person, in some cases several generations apart, it approaches Lovecraftian levels of insanity. On top of which, I'm trying to reconcile Snorri's Prose Edda genealogy with the genealogies of the Poetic Edda, but that's been the least of my headaches. It actually fits very well... until you try to assign consistent dates that make sense for human generations, much like the Old Testament patriarchs... which gives me an idea. I just really need a way to accommodate "BCE" dates in GenoPro... and I need it last year. The Greek gods were fun to chart too. Odin has *nothing* on Zeus in the "partners and offspring" department. And to keep this thread on topic, I'm in agreement with appleshaw on the chronological arrangement, but I think I mentioned that already.